Marked Watervliet Arsenal N.Y US w/ inspector marks P.V.H. The tops are stippled and were a favorite among cavalry officers as they could be brightly polished. Often used w/ the McCllean Saddle but original equipment for the Grimsley saddle. Commonly reffered to as "Artillery stirrups." 1872 Cavalry Helmet Eagle. Enlisted men's model 1872 plumed dress helmet eagle, authorized for mounted troops and signal corps. (4 inches X 4 1/4 inches) This is a spectacular artifact, in perfect dug condition. 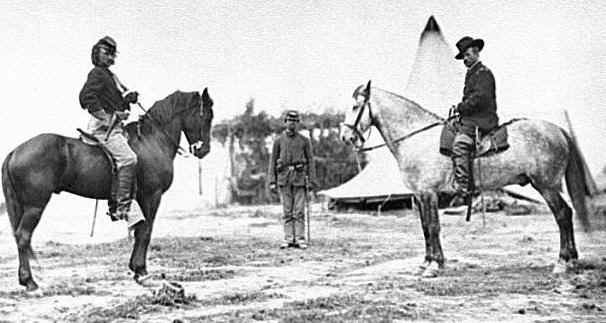 It was found at a western fort site, and in all probibility, came from an enlisted man in the second U.S. cavalry. Indian wars cavalry spur. Found at a 10th cavalry fort site.